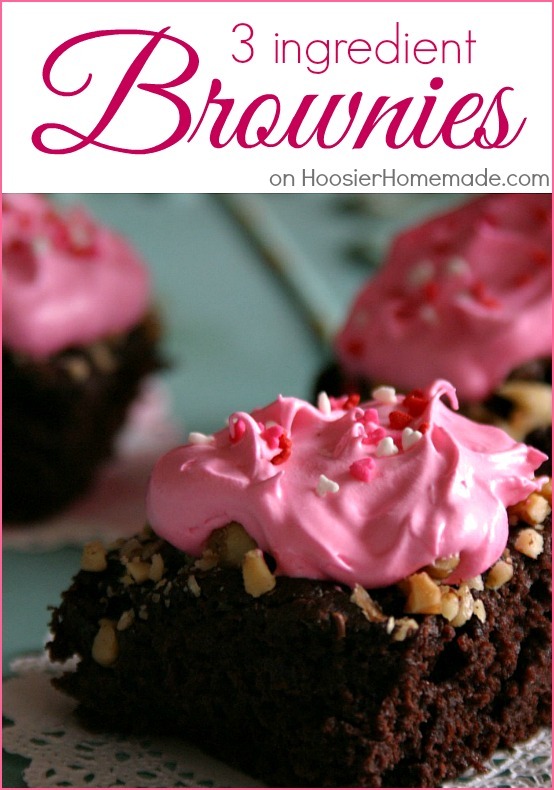 Although these Brownies are super simple with just 3 ingredients, you can easily add toppings and frosting to make them even more special! 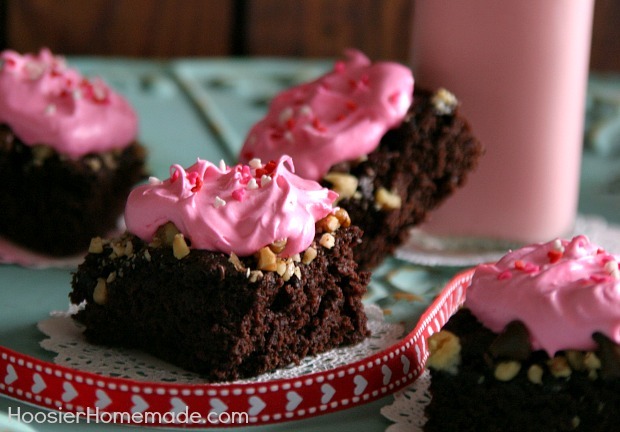 For Valentine’s Day, I added luscious Marshmallow Frosting and a few heart sprinkles. So let me tell you about my love-hate relationship with brownies. I love eating them…hate baking them! Yup..sorry I do! I have tried and tried to find a recipe that was fudgy but not too fudgy…cake like but not too cakey, etc. etc. I had finally given up and just decided to use a box mix, which also didn’t always come out right. 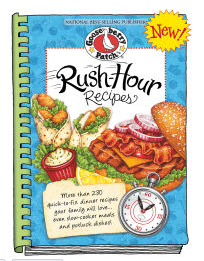 And then I found this recipe in Gooseberry Patch Cookbook, Rush-Hour Recipes. It quickly became not only a favorite with me because it’s so easy but also a favorite with the family! You are going to love how easy this recipe is to make! Just 3 ingredients!! Well unless you add the chocolate chips and nuts to the top, which of course you must do! Oh and the frosting…yes! You MUST slather it on!! You heard that right…I told you to slather the frosting on!! So what’s the secret to these delicious Brownies? Chocolate pudding…just one small box. Oh and the frosting helps quite a bit too. 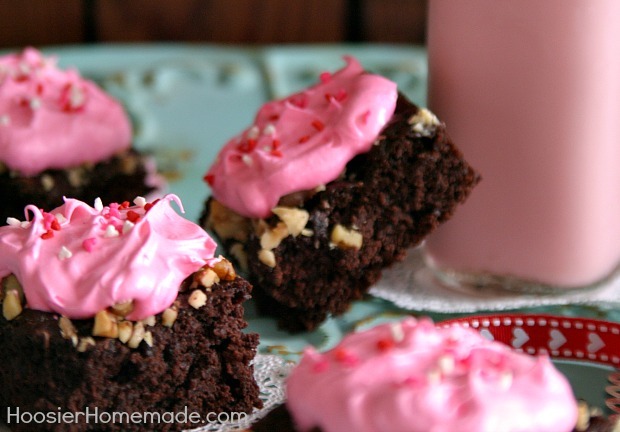 Now, of course, they are delicious without the frosting, and actually the recipe in the book doesn’t call for frosting, but with Valentine’s Day coming up, I just had to add the little pink to them. You can certainly change them for any occasion, they make a great birthday treat, baby or bridal shower dessert, or even add the colors of your favorite team and serve them on Game Day! I found you on Pinterest and thought, “What could be better than brownies?” I had to laugh when I saw the recipe, though. It’s the one I use, and it’s been my mom’s go-to desert for years. (The only difference is that we do use the instance pudding mix, and we just mix in with a mixer, rather than on the stove top.) But we’ve always used regular chocolate frosting; I’m super excited to try them with your frosting. It looks heavenly. These brownies look AMAZING! Love that bright pink frosting! Thanks so much Trish! They are cake like, but I really like them and they are super easy too! this brownies look delish!!! I’m on my way to get the ingredients and bake them tonight. Thank you for sharing this recipe. These are so yummy looking! What a great time saver! Awesome and making me very hungry. Great job! I hope you will link up to my I Heart Projects Party if you haven’t already. These look awesome! 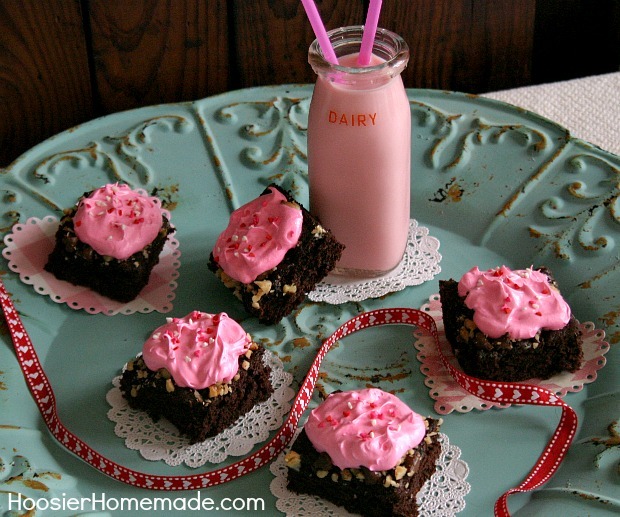 My hubby LOVES brownies (more than cake!) and his birthday IS Valentine’s Day so this might be a win win for me! Thanks for sharing! Thanks Coley! I bet he will LOVE these! And they are super easy too! Thanks so much for sharing this on Friday Food. My mouth is watering. What a pretty way to celebrate the sweetest holiday! These look yummy! I love how you have the save/print recipe card. I need to figure out how to do that. 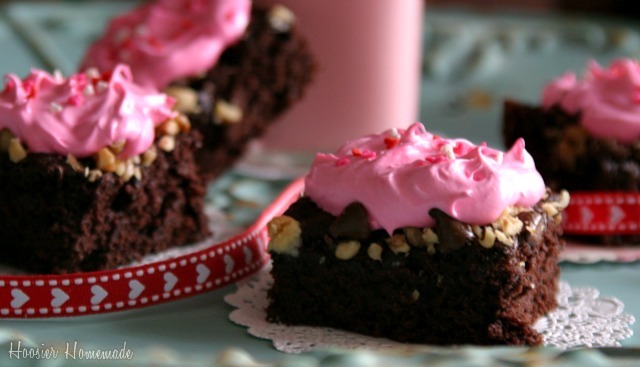 Thanks for sharing this delectable Valentine’s Day Dessert! Excellent! I appreciate the tip! Thank you for posting this recipe!! It was the perfect pre-bath activity for my 4 year old nephew tonight. By the time he was all pruney, the whole house smelled like chocolate. So glad you liked it Victoria!! Thanks for letting me know! These look so amazing! I just pinned them! =) Following you on facebook! WOW, those brownies look amazing, I may have to make them this weekend, thanks for all the wonderful baking ideas and recipes.